Despite evidence to the contrary, a mechanical gaming keyboard doesn’t need to have bright glowing LED lighting. Cooler Master’s MasterKeys L PBT favors style over substance, losing the light show and adding some lovely thick keycaps to create an excellent sub $100 keyboard. Known for its computer cases, power supplies and cooling solutions, Cooler Master is also a big name in computer peripherals. Mice, headsets, keyboards—it’s a company that really wants to have its name all over your gaming PC, inside and out. The company has done especially well in the mechanical keyboard scene, where many mainstream mechanical keyboard manufacturers (Razer, Logitech) are regularly dumped on. The MasterKeys series is well-regarded, and mentions of the company’s high-end, hybrid capacitive Novatouch keyboards are accompanied by the sounds of singing angels from on high. Most boards in the MasterKeys line feature LED lighting and thinner ABS (acrylonitrile butadiene styrene) keycaps to allow the light to shine through. The newly-released MasterKeys PBT boards, available in both full-size (L) and tenkeyless (M), do not have lights. Instead they feature 1.5mm thick keycaps made of PBT (polybutylene terephthalate), a pricier plastic that’s very resistant to wear and shine. The MasterKeys PBT boards also feature a 32bit ARM Cortex processor to aid in precision and performance. Macro commands can be programmed directly on the keyboard using a unique set of shortcuts. No external software is necessary. And for fans of alternative layouts, the MasterKeys can be switched from standard Qwerty to Dvorak or Workman as well as different operating system-specific layouts on the fly. The MasterKeys L PBT keyboard I tested came packaged with a detachable USB cable, a key puller and a set of red alternative caps for the Q, W, E, R, A, S, D keys. PBT Keycaps: How big a deal are PBT keycaps? Big enough that Cooler Master put them right in the name of the board. Thick and sturdy, the keycaps on the MasterKeys L PBT give typing and gaming on the keyboard a better overall response than one would get with cheaper ABS caps. Another oft-overlooked benefit of PBT keycaps is the way it changes the sound of typing. Mild-Mannered: Understated. That’s a good word for the MasterKeys L PBT. It’s not just the lack of LED lighting. The board is an unassuming black rectangle with black and white keys. Aside from a couple of shortcut sub-legends on some of the keys and the OS keys replaced with Cooler Master logos, this is pretty much a gaming keyboard in a business suit. Nice Switch Selection: Like its lighted cousins, the MasterKeys PBT features a variety of Cherry MX mechanical keyboard switches, including tactile browns, clicky blues, linear reds, silver speed switches and my current favorite, heavy clicky MX greens. Greens require a bit more force to actuate and remind me a bit of IBM’s classic buckling spring mechanism. 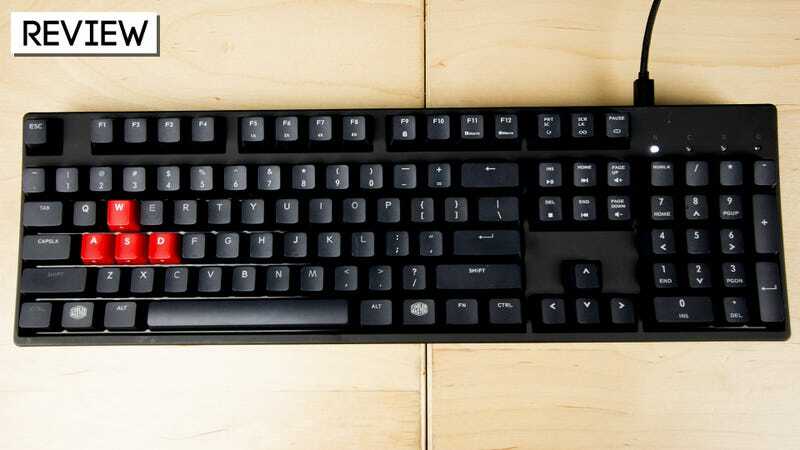 On-The-Fly Macros: Rather than rely on software to create macros for common gaming or workplace situations, the MasterKeys L PBT allows users to create them directly on the board. Not The Sturdiest: Build from a combination of plastic shell over metal plate, the MasterKeys L PBT has quite a bit of flex to it. And while the matte black plastic looks nice, the board has a somewhat cheap feel overall. Not unexpected in an $89 keyboard. Fading Legends: PBT keycaps are strong and sturdy, but their wear resistance depends a lot on how the legends are applied to the keys. The numbers and letters have a raised feel to them, and raised legends can be worn down. I’ve been playing a lot of Final Fantasy XIV lately, and after less than a week in use the left Shift and Control keys have faded to near nothingness. There’s quite a lot of shine on the key faces as well, which isn’t great considering I’ve on my been using the board for a couple of weeks. PBT is a big buzzword in mechanical keyboard circles, with many immediately equating the pricier plastic with quality. But there’s a scale to PBT quality. One can buy a cheapy set of colored Tai-Hao caps for $40, or they can spend $200 and up on a set from GMK or Signature Plastics. Cooler Master’s PBT is much closer to the low end than the high. One way to deal with fading and shine is to take the offending keys away and replace them with better ones. The MasterKeys L PBT accepts standard MX-compatible keycaps, and the layout is so basic that just about anything will do. You don’t have to have the key lights on to have a good time with a mechanical keyboard, oh no. There’s a place for flashing RGBs, and there’s a place for low-key elegance. The Cooler Master MasterKeys L PBT offers a taste of the latter at a relatively low cost. You can use the money you save to explore alternative PBT keycaps when these start to fade.